What products do you use to make your skin glow - not in the messy glittery way but with a pretty and dewy radiance? My picks are liquid illuminators as they are easy to work with and can be layered onto skin for different levels of intensity. 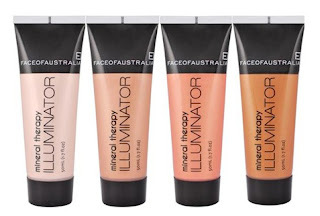 The recent release of a set of new illuminators has won me over and let me tell you they are fast becoming my hottest summer makeup must-have items. Mineral based liquids with light-reflecting colours. Its formula contains Jojoba, Vitamin C & E and is suitable for sensitive skin and all areas of the face and body. These come in massive 50ml tubes, more than enough to last for years if you are only doting small amounts on your face so why not use it on your body as well – highlight those collar bones , shoulders and arms yours during a night out. I have 2 shades from the goodie bag received at last years MBBE event. Angel Mist is a mico-shimmery silver white liquid illuminator while Angel Blush is a micro-shimmery with bronze pigment . 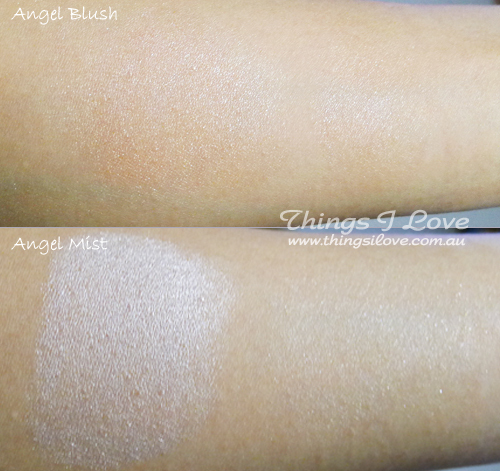 I found that Angel mist was more watery/runny than Angle blush but it makes it easier to work and blend with. Angel Blush was just as easy to blend despite being a slightly thicker consistency. The other two shades in the range is Angel flame (a peachy golden sheen) and angel Glow (a deep bronze) which I don’t have yet but I have full intentions to add to my collection and I can see Angel glow would be perfect for creating the sculpt look for cheekbones. I love angel mist above my cheeks and on my brow bones and brigdge of my nose – the glowy dewy look. Angel Blush gives me just the right amount of colour for a healthy sun-kissed look – perfect for faking my healthy glow since I stay away from the sun and don’t have the perfect complexion. In terms of consistency, I think these are comparable to Benefit’s Moonbeam and Highbeam after running to my mini vials from the Valley of Stars kit to do a quick check. 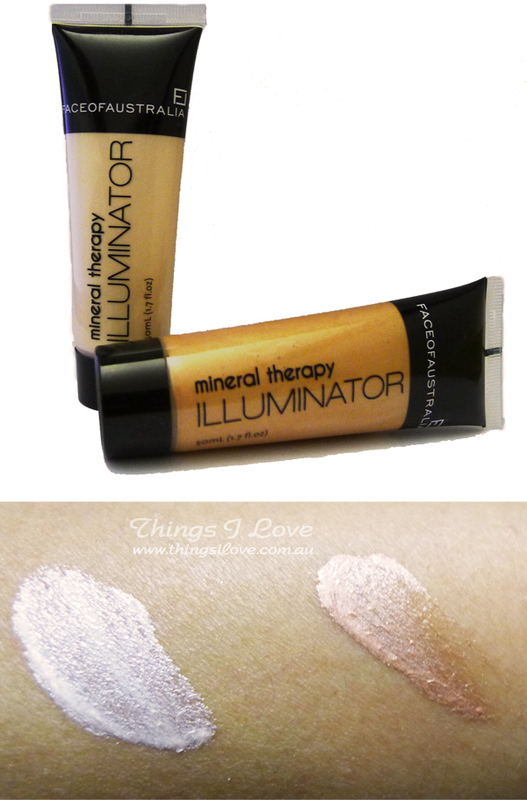 Colour wise, Benefit illuminators are quite different as both have an iridescent sheen to them. The price difference between the two ($48 for 13ml vs $14.95 for 50ml) makes it easy to choose Face of Australia as an everyday product to use of if you are just trying out using liquid illuminators and save Benefit’s for special occasion only. As a liquid blush using Angle blush and Angle Flame. As an eye shadow or a base base for shimmery looking eyes. Angel Mist is particularly good for the inner eye corners for that bright eye look. Which is your favourite illuminators? Mine is Angel Blush and Angel Flame. RRP A$14.95 available now for a limited time at Priceline, Big W, Kmart, Independent Pharmacies and Fashion Addict online. This product was provided at the MBBE event. It is really a amazing. I like your concept.Thanks for providing good products. Thanks for sharing us. I loved the pearly sheen look it gave to my skin but I noticed some specks of glitter around my face that looked more apparent than the lovely pearly sheen. My mum noticed it too. :( Or maybe I applied too much..
Hi Kimyen, I just checked out my tube of Angel mist again tonight and I don't notice any glitter in it at all. There are very very micro shimmer and what I would call slightly larger flecks of shimmer (nothing I would large bits though). If you are experiencing uneven glitter, perhaps give the tube a good shake before use (I found Angel mist to be more watery than my Angel Blush). Another thing you can try is to get a blending blush like the simga F80 or a kabuki brush to blend off any excess shimmer/glitter for a more subtle look if that's what you prefer. I actually tried the Angel Glow with my winter foundation and found it gives me the colour I usually strive in cold weather.